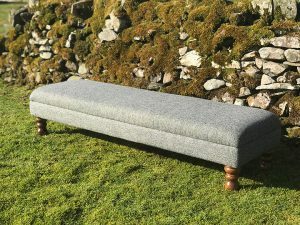 Bespoke footstools from SPK in collaboration with Eskdalemuir footstools. Custom made to measure to your specification. Comfortable enough for a footstool or extra seating, firm enough as a coffee table. Very popular as an alternative to coffee tables as they are multi purpose. Quality is of paramount importance, only the finest materials are used to make our bespoke footstools. Optional drawer with full extension, soft close, fully concealed drawer runners. Photo shows our standard size footstool at 850mm long x 550mm wide. 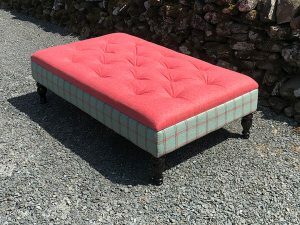 All of our footstools can be bespoke, made to measure. Upholstered in Harris tweed ‘Lovat herringbone HB52’. Picture shows our fluted legs polished dark oak & fitted with brass castors. Photo shows recently completed bespoke footstool at 610mm (24″) square x 380mm (15″) high. All of our footstools can be bespoke, made to measure. Upholstered in Abraham Moon fabric . Picture shows our fluted legs in polished walnut. Photo shows our standard size footstool at 850mm long x 550mm wide. All of our footstools can be bespoke, made to measure.Upholstered in Harris tweed ‘NHB2’ for the top, and Abraham Moon ‘Dales collection Malham natural’ for the base. Picture shows our fluted legs polished dark oak & fitted with brass castors. This is the deep buttoned version – buttons are covered in the base fabric. Photo shows our standard size footstool at 850mm long x 550mm wide. All of our footstools can be bespoke, made to measure. Upholstered in Harris tweed ‘Machair from the Gaidhlig collection’. Picture shows our fluted legs polished dark oak without castors.